1. When Chuck Norris does a pushup, he isn’t lifting himself up, he’s pushing the Earth down. 2. There is no theory of evolution. Just a list of creatures Chuck Norris has allowed to live. 3. There is no chin under Chuck Norris' beard. There is only another fist. 4. Chuck Norris has two speeds. Walk, and Kill. 6. If you spell "Chuck Norris" in Scrabble, you win. Forever. 7. Chuck Norris does not sleep. He waits. 8. Chuck Norris once shot down a German fighter plane with his finger, by yelling, "Bang!" 9. Chuck Norris doesn't read books. He stares them down until he gets the information he wants. 10. 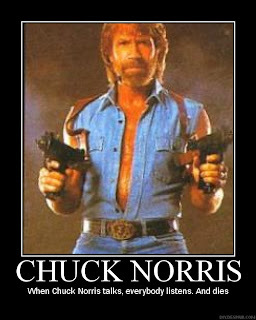 Anytime someone is elected president in the United States, they must ask permission from Chuck Norris to live in the White House. The reason for this is because Chuck Norris has won every Federal, State, and Local election since 1777. He just allows others to run the country in his place. 11. Chuck Norris destroyed the periodic table, because Chuck Norris only recognizes the element of surprise. 12. In a fight between Batman and Darth Vader, the winner would be Chuck Norris. 13. Chuck Norris is suing Myspace for taking the name of what he calls everything around you. 14. The opening scene of the movie Saving Private Ryan is loosely based on games of dodgeball Chuck Norris played in second grade. 15. Remember the Soviet Union? They decided to quit after watching a DeltaForce marathon on Satellite TV. 16. Chuck Norris is currently suing NBC, claiming "Law and Order" are trademarked names for his left and right legs. 17. Every time someone uses the word "intense," Chuck Norris always replies, "You know what else is intense?" followed by a roundhouse kick to the face. 18. Chuck Norris is so fast, he can run around the world and punch himself in the back of the head. 19. There are no steroids in baseball. Only players Chuck Norris has breathed on. 20. In fine print on the last page of The Guiness Book of World Records, it notes that all world records are held by Chuck Norris, and those listed in the book are simply the closest anyone else has ever gotten. 21. Chuck Norris can divide by zero. 22. Chuck Norris once kicked a horse in the chin. It's descendants are known today as Giraffes. 23. Chuck Norris has the greatest poker face of all time. He won the 1983 World Series of Poker, despite holding only a joker, a Monopoly get-out-of-jail-free card, a two of clubs, a seven of spades, and a green #4 card from the game UNO. 24. Chuck Norris counted to infinity -- twice. 25. We live in an expanding universe. All of it is trying to get away from Chuck Norris. Is faith a gift? Yes and No.